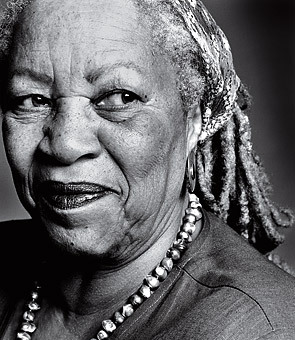 I've never actually read any Toni Morrison. How awful is that? I've got an award for you. You can pick it up here. She's such a beautiful lady. I love the picture of her. I love this picture too. It's so engaging and welcoming. And La Coccinelle, it's not awful, but you should remedy it. She can be difficult, I'm not going to lie, and she's not everyone's cup of tea, but my god, the woman can write. She is a master at finding a balance between humor and pathos. Love her.